My name is Mike Mayhew, founder and president of Beach House Miracles. Having been in the remodeling business for over 35 years, and working exclusively at the beach for over 15 years, I am well aware of the biggest frustrations that can turn your dream beach house project into a renovation nightmare. This experience is the reason that Beach House Miracles has risen to the top and is the superior design and renovation company in the area. I have created a fail-proof system that not only avoids pitfalls and unpleasant surprises but creates world-class beach homes you will enjoy for many years. It’s easy to claim to be a specialist or the best or most knowledgeable when the client can’t be on location to inspect your work. There is a saying in the trade, “Caulk & Paint make you the Carpenter You Ain’t”. Meaning, a pretty paint job covers all the shortcuts. Beach House Miracles categorically rejects such appalling and incompetent standards. In fact, we created a controversial report that reveals the worst offenses that some contractors commit just to make more money, meet tight schedules, or just because they’re lazy. Unsuspecting consumers are unaware of these shortcuts because it’s behind the walls, under the floor, or in the ceiling. These are details that separate a quality renovation job from a sub-standard job that continues to give you headaches and hassles long after the job is done. 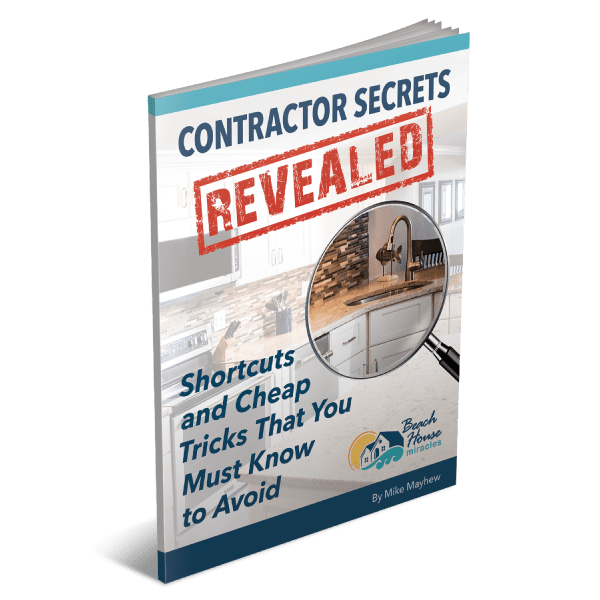 Before you hire any contractor, get a copy of “Contractor Secrets Revealed: Shortcuts and Cheap Tricks That You Must Know to Avoid!” to make sure you get what you’re paying for and don’t get ripped off by unscrupulous, unknowledgeable, or lazy contractors. Mike, send me a copy of "Contractor Secrets Revealed: Shortcuts and Cheap Tricks That You Need to Avoid!" Also, I understand I may get occasional emails from you with interesting tips, offers, and ideas for beach house remodeling.